I have been in a bit of a reading slump for a few months now and though I have still been forcing myself to read a little here and there to try to get me out of it, that wasn't really helping. That is, until I listened to the audiobook of All Our Yesterdays. I have actually been wanting to read this book for years! Back when I was a baby blogger years ago, it was one of the books I first summoned up the courage and requested. I didn't get it back then, so I went forward with the books I did get approved for and put this one on my back-list. Oh, what a mistake that was. 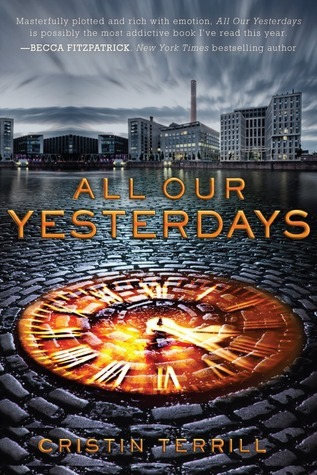 All Our Yesterdays is a brutally honest story about facing your past, and how each choice shapes your future. Terrill really explores the ramifications of each decision a person makes, and how even when intentions are good, it doesn't necessarily mean the outcome will be. This book is dark and emotional and bittersweet and I truly adored every minute of it. If like me, you held off on this book—YOU STOP THAT. Trust me, you're missing out on a masterpiece. Meredith Mitchell deserves a round of applause for this audiobook because she was absolutely phenomenal. She gave every character their own unique voice and tone. It was so easy to know which character was speaking. Mitchell brought the whole book to life so skillfully that now I want to listen to every single audiobook she has ever recorded—including ones where I was not initially interested in the book itself. 1) This is a heavily character-driven book, so each of the characters—including the minor ones—are incredibly well-developed. Even for side-characters, you get a great sense of who each person is, what they sound like, and how they think. For the main characters, you get an intense look into each of their personalities, quirks, pasts—everything. Additionally, there are no innocent characters in this book, and that is part of what makes them so relatable and lovable—even in those moments when they're being nonsensical or villainous. Terrill really wants you to see how flawed each of the characters are. This is accomplished in such a skillfully transcendent manner that you feel like these are real people, and it's just breathtaking—literally. 2) When it comes to time-travel novels, I often spot a lot of holes in the plot. I find myself asking a lot, "why didn't X just go back a couple more seconds and stop Y from happening?" But for each of those moments here, there is an explanation for it. This book gets extra applause for a superbly executed plot. 3) Oh my god, you guys, where do I even begin with the writing in this book? It's seemingly effortless and charming, without being extremely complicated or pretentious. Terrill knows the most effective and emotionally evocative way to chip away at your soul with her writing. 4) This is the perfect thriller for readers who are scaredy-cats like me. Without being too bloody or "horror-like", this book kept me firmly at the edge of my seat the whole time. My heart felt like it was in my throat, my palms were sweating, and I was just a huge mess of jumbled emotions and feels. It was perfect. Note: Since I read this as an audiobook, I took all of these quotes from the book's Goodreads page. But progress is always dangerous, isn't it? Most of the time, walls don't get dismantled brick by brick. Someone has to crash through them. It's always been you and me, James. That's why I can't kill you, and you can't kill me. Because even if it means the end of the world, I love you too much. His expression is an open book to me, because I took the time to learn the language many years ago. The doctor's most powerful weapon has always been his particular brand of brutal honesty. Bruises fade, but words like that fester. Yes, you definitely do! It's such a good read. Yes, you definitely should! I highly recommend it. And I need to read Here Lies Daniel Tate! This is a time-travel book you need to give a shot because it's mind-bending! I hope you check it out soon. I need this book in my life, like, NOW!!!! Everything sounds so freaking perfect (pardon my language). Well-developed characters and time-travel? You can definitely count me in! Thank you for sharing Brittany. You really do, trust me! It's so amazing and I couldn't stop listening to it. Definitely read it asap! EEEE! I am SO happy that you loved this book sweetie :D I read it years ago, and I loved it, but gosh, I must re-read. Think I would love it even more now. <3 Sigh. Wasn't it just beautiful? :) And evil. Yet so perfect. Highly suggest a re-read as an audiobook! It will bring the book back to life for you! The cover looks familiar, but I can't place the book . . . Yet, after reading your review I have a feeling this should go straight to my TBR pile! I hope it does! I'd love to see your thoughts on it. GAH, I keep telling myself I am going to read this, and then run out of time and forget. I cannot allow myself to continue this, I have heard the most amazing things, including your wonderful review! I must make time! No, you really can't. You're missing out! It's soooo good, and I'd love to know what you think of it. I loved this book as well! But it needs a sequel and the author says one isn't coming. :-( Great review, so glad that the book definitely is just as good as I remember! I wouldn't even know what a sequel for this one would look like since the ending had so many possibilities.